Singapore Airlines unveiled its new cabin offerings, as part of a $1.16 billion overhaul. 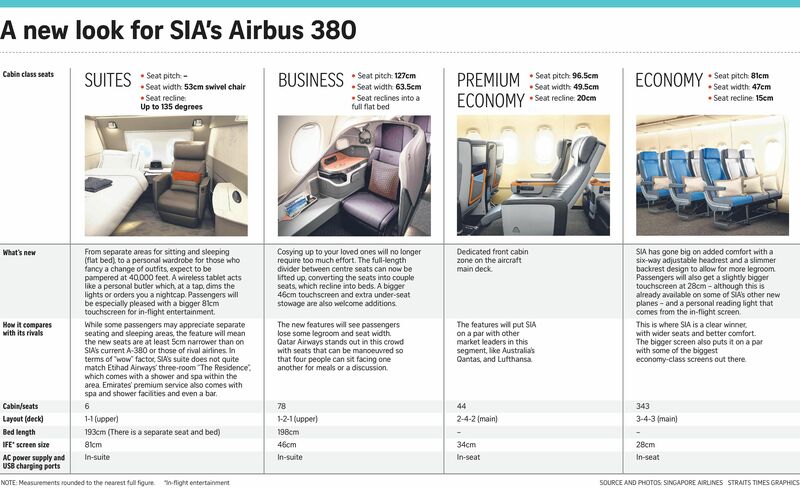 Singapore Airlines (SIA) has revealed - as it unveiled new seats and other in-flight products as part of a US$850 million (S$1.16 billion) investment - that its Airbus A-380s will carry more passengers in economy and premium economy than they do now. The move is seen by industry analysts as an attempt to bolster profits amid a challenging environment that has dampened demand for premium air travel, and serious competition from rival carriers like the Middle Eastern airlines - both of which have hit the bottom line. SIA chief executive Goh Choon Phong told The Straits Times during the new product unveil yesterday that the decision to reconfigure was driven by a need to better match demand and supply. Whatever the motivation, customer comfort and convenience will not be compromised, he stressed. The new seats will be fitted on five new A-380s - the first will arrive next month - that SIA has ordered. Each superjumbo aircraft will have a total of 471 seats - six ultra-first class suites, 78 in business class, 44 in the premium economy cabin and 343 in economy. The airline's current fleet of 18 A-380s has up to 441 seats each, including 333 in economy class. They will be retrofitted from now until 2020 to ensure product consistency for customers. After four years of design, development and research, SIA's much-awaited new products were unveiled at a media launch in Suntec City, which was attended by more than 100 journalists from Singapore and around the world. Mr Goh expressed confidence that the upgrades across all four classes - aimed at providing "more space and privacy, and with more details to personal needs", as well as the first major product enhancements in about four years - will appeal to customers. Economy passengers can expect more legroom and back support, with a six-way adjustable headrest, while a 28cm touchscreen monitor eliminates the need for handsets. Business-class highlights include a full-length divider between centre seats that can be lifted to convert the seats into couple seats. There is also under-seat stowage for cabin and laptop bags. The new products will feature the launch of myKrisWorld - a new in-flight entertainment system with interactive features that are an industry first, including content recommendations based on customer preferences and viewing history. KrisFlyer members will also be able to bookmark content, as well as customise and save preferences on myKrisWorld, for subsequent flights. The investments demonstrate SIA's commitment to continued investment in products and services, and its confidence in the future of premium full-service air travel, Mr Goh said. Endau Analytics' Shukor Yusof said the airline should move away from focusing on the premium sector. "The reality is, fewer people are likely to pay the stratospheric fares SIA is charging in all classes - these are at least 20 per cent more than rivals like Cathay Pacific, Emirates and Qatar Airways," he said. Regular traveller Gary Ho, 42, who "loves" the new business class, is not complaining. "Gone is the impractically super-wide seat" that one had to get out of, before it could be converted into a bed, and "numerous small storage spaces which could hardly store anything", said the polytechnic lecturer. In their place are seats that can recline to a flat position as well as large storage spaces. Mr Ho said it "looks like SIA has been listening hard to its customers".